I've got a few photos of my trip to Milan. My first and most important stop was the Duomo. 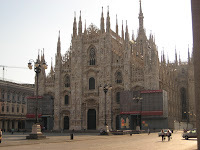 The Milanese will be very familiar with it, but at first sight it's very impressive. The whole marble surface is festooned with elaborate reliefs and statues. I've got some good shots of Judith and Holofernes, Abraham and Isaac, and David and Goliath (all of which involve severing or near-severing of heads) and the Tower of Babel. Unfortunately, I haven't been able to find Saint Augustine's baptismal font, Rick. 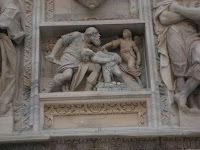 It isn't at San Ambrogio; apparently it's under the Duomo. A 4th century baptistry has been uncovered there, but it's not open to the public. I climbed up to the roof of the cathedral, where everything, including tiles and gutters, are made of carved marble. 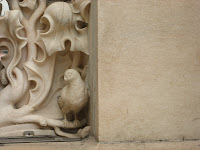 Just to add a little detail, I found this carving of a bird in a stairwell. It's a small example of the elaborate work.